Interview with Elizabeth Chadwick | Wendy J. Dunn, Award-Winning Author. Wendy J. Dunn: Thank you, Elizabeth, for agreeing to this interview. Can you give people examples of the kind of ghost story that really appeals to you? Elizabeth Chadwick: If it’s a historical ghost story then obviously it should have the elements that are important to any piece of historical fiction, i.e. a strong feel for the time in which it is set. It should draw the reader into that period so that it couldn’t possibly happen in any other time and place. As to the elements of a good ghost story, which should marry in with the historical detail… Hair raising tension and suspense are essential, as is atmosphere. I adore ghost stories and avidly devour them whenever I can get hold of them. My favorite of all time is actually a novel – Stephen King’s The Shining . I consider it a classic of its kind. The bathtub scene (those of you who have read it will instantly KNOW the scene I mean) is probably the most frightening thing I have ever read. I didn’t want to turn the page! I have enjoyed the ghost stories of M.R. James and such tales of his as Oh Whistle and I’ll Come to You My Lad, and The Monkey’s Paw. They definitely raise a shudder! I quite enjoy Susan Hill’s ghost stories too – The Woman in Black and The Mist in the Mirror, but I regard these as ‘cozies’ when compared to King’s The Shining . W.J.D. : Do you have a historical personage from Tudor times you would like to write about? Why – or why not? W.J.D. : I know – I know – you’ve probably been asked this question many, many times, but why do you write historical fiction – especially that set in the Middle Ages? E.C. : I became interested in the Middle Ages as a teen, when my imagination was captured by a variety of film and TV programs that led me to start writing – e.g. The Warlord starring Charlton Heston and The 6 Wives of Henry VIII starring Keith Michelle. There was also a drama about Henry VII. The kick start to my writing career though was a story about a knight in the Holy Land and the program was titled Desert Crusader. It was on children’s TV – not something that would happen today! My interest having been roused, I started researching the Middle Ages and the more I researched, the more fascinated I became. W.J.D. : What do you consider is historical fiction? Is it fact-driven fiction, adhering to what is known of history in an attempt to bring it alive? Or is it a medium a writer uses to make sense of contemporary concepts? Or…? E.C. : I would say the second – attempting to bring known history to life for a modern audience. Obviously we are very much products of our own time and we can never climb exactly into the mindset of a past era, but we can have a good try and in that attempt, bring our readers with us and encourage them to use their imagination, and even go and research a subject for themselves. W.J.D. : What (if any) are the responsibilities of the historical fiction writer? E.C. : To write with a reasonable degree of accuracy and integrity. I think the latter word is probably one of the most important in a historical novelist’s vocabulary – INTEGRITY. W.J.D. : What is more important to you – history accuracy or writing a good story? E.C. : The two should not be mutually exclusive. A writer who knows his or her job should be able to combine the two seamlessly. E.C. : Sights, sounds, smells etc. Dramatic scenes that evoke emotional resonances in my readers. Three-dimensional characters who step off the page into the readers’ room – you know, the usual stuff that all writers aim for. W.J.D. : Popular and literary fiction – what makes a novel one instead of the other? E.C. : Literary – richer, more thoughtful use of language. More experimental with ideas. Often the ideas matter as much as the narrative drive. Can be rather up its own fundament and hard going at its worst, but at its best can be subliminal. I love the work of Jane Gardam who is a very accessible literary author (although not particularly historical). In her collection of short stories Missing the Midnight, she has a wonderful long short story about The Green Man. I suppose it comes back to my love of mythology. W.J.D. : Of all your novel children , is there one with a special place in your heart? E.C. : Tough call. Always the one I’m writing at the moment – it goes without saying. Other than that, The Wild Hunt I suppose for pushing open the publisher’s door and winning me a Betty Trask Award. 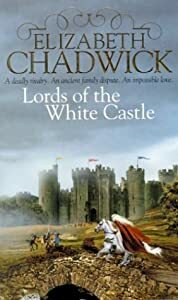 After that, Lords of the White Castle because it was my first attempt at writing with real characters as my protagonists as opposed to imaginary ones and I received a huge number of e-mails about it. I do believe that it took my career to a new level. W.J.D. : One last question…is your husband…scratch face, purse lips, chew knuckle…still living up to his role as your research assistant? E.C. : Definitely a knight to remember!!! To learn more about Elizabeth Chadwick, visit her homepage .